It says something about the confidence of a government when they are desperate to minimise attention on their own policy announcements. And it’s hard to believe that wasn’t their intention last week when they tabled a slew of twenty-one written ministerial statements on the very last day of parliament. Each one of those statements could have been delivered by a minister to the House of Commons, allowing them to explain their policy in full and take questions from us, MPs elected to represent our constituents who are affected. After all, these were decisions that affected hundreds of thousands of public sector workers, the organisations they work in and the people they serve. The Department for Education sneaked out a significant change to their pay policy. The government’s preferred headline was that this represented a 3.5% increase for classroom teachers. Having imposed real-terms pay cuts year after year, any change of heart is welcome but it is clear this one was driven by the campaigning of teachers and their trade unions, with the support of parents across the country. That headline, perhaps unsurprisingly, did not entirely stand up to scrutiny. Within hours, the Institute for Fiscal Studies found that a majority of teachers were actually facing another real-terms pay cut, while only 40% of teaching staff get the full rise, which itself is only just over inflation. No wonder ministers weren’t keen to open themselves up to questioning. They will know that they evade it by announcing policy on the last day of the summer session. The next opportunity for MPs to quiz them will be in September, in a session that lasts for a total of seven days before another recess. Ministers have had the School Teachers Review Body report since early May. The Education Secretary, Damian Hinds, had been pressed repeatedly to make a statement on it by schools, teaching unions and Labour’s frontbench – most recently on 19th July. In response he said that there was nothing he could say for the time being. Clearly, the government was holding out until the last possible moment to put the best possible gloss on their announcement. That delay suited their spin, but not our schools. Tory cuts to education have left many tightly squeezed budgets and the delay has made it impossible to plan for the coming school year as they don’t know how much they will need to pay their teachers next year, and whether the increase would be funded. Money was put aside for staff salaries that could have been spent on other educational needs. But we can see why they were so keen to avoid too many people reading the small print. The government has ignored the recommendation made by the independent pay review body for an across-the-board increase on pay and allowance. And their claim that this announcement is a ‘fully funded plan’ doesn’t reflect the reality that schools will need to find £250m from existing budgets which have been cut by £2.7bn since 2015. With no central funding from the Treasury, other education spending will have to be cut to fund the extra grants that schools will get. The government has yet to tell us where they will get that money from. The last time that that they promised to fund schools through “efficiencies” and “savings” from the department, they broke their own promise to protect the Healthy Pupils Fund and cut back further on funding that could have been available for desperately needed new places and maintaining our crumbling school buildings. This time, we don’t know where the axe will land, and they have deliberately stopped us being able to ask them directly. The Education Secretary recently accepted the pressures teachers were under and said he was trying to “squeeze more funding out of the Treasury”. That clearly hasn’t worked: there’s no new funding from Number Eleven. That is a stark contrast to Labour’s alternative. We would not only listen to the independent pay review bodies: in education, we would also restore the pay body that the Tories abolished for school support staff, who have been left out of this week’s announcements. We would not play off different public sector workers against each other but end the pay cap for all. And we would do that with new central funding from the Treasury so that schools are not left to bear the burden. Apparently, Damian Hinds failed in his mission to get that deal from the Chancellor. Education deserves better – and that is exactly what Labour has to offer. 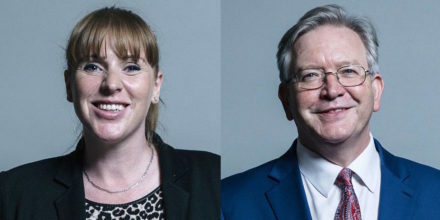 Angela Rayner MP is Shadow Education Secretary and Peter Dowd MP is Shadow Chief Secretary to the Treasury.